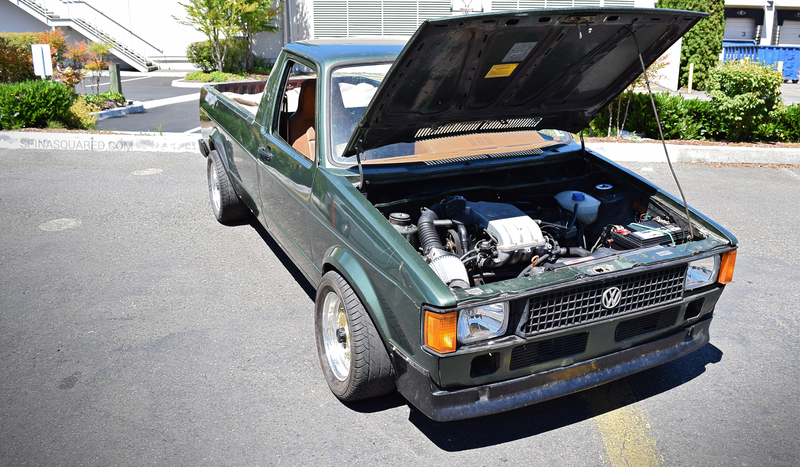 When we wrapped up Pt.5 of our VW Caddy project we had a running engine! Hearing that ABA fire up and sit idling without a hiccup was exciting to say the least. We were so anxious to drive it! But there was more to be done. We still needed the lights working, figure out what to do about the rear suspension, throw the new rear drum brakes on, get the windows back in, then register it before it was ready (and legal) for street use. Remember that missing headlight? While visiting with Hans about our VW Golf project we scored a set of unused crystal clears he had collecting dust. The new lights were installed at the first available opportunity! Brendon brought with him a set of 13″ Enkei 92 wheels he once rocked on his Mk1 GTI that no longer fit due to a brake upgrade. Bolting them up to the caddy was all he needed to do to convince us to buy them. A GTI front spoiler that a good friend gifted to us was also bolted up and the caddy took on a whole new look! The Euro Sport 4-point lower front stress bar we ordered also arrived and was bolted in place. Before moving to the back to work on brakes and suspension, Brendon wanted to get all the lights working. That meant shopping for new bulbs, wire, connectors, heat shrink, and anything else we thought we might need to ultimately refresh what hasn’t already been repaired. Then Brendon spent the next two days testing and repairing just about every electrical connection. The wiring for the tail lights, front and rear turn signals, and license plate lights were repaired and new bulbs were installed. He built and installed a relayed headlight wiring harness while throwing in a set of 80/100W H4 bulbs we sourced, then he removed the stock fuse-able links and replaced them with a fuse box behind the battery. The turn signal and fuel pump relays, hazard switch, turn signal stalk, and wiper stalks are also new as the original pieces were falling apart. At this point we had just about everything power related repaired and working, except the wipers. To fix those we will be replacing the wiper frame, one of many miscellaneous items we will need to pick up from Chris at Fine Tuning. He has been a tremendous resource throughout this build! It was finally time for new rear brakes. After a proper brake fluid flush and the rear end reassembled we were ready to see the caddy move under it’s own power! Brendon took the wheel and we went for a quick spin down the road and back… It drives!! Our maiden voyage was a successful one with the exception of a fuel pump whine, a sure sign of what we had feared all along – a clog in the fuel tank at the pick-up point meant we would have to replace or restore that tank after all. We will drop the tank next and figure out which direction we will need to go. Meanwhile, there is no denying we are very pleased with how things are looking and the progress made thus far! Note the popped hood for throttle body clearance, a look we have embraced and intend to keep. And we’ll run the single, “gold tooth” look on one side while deciding which finish to ultimately run on these Enkei wheels. After figuring out the fuel tank problem we just need to throw the rest of the windows back in and start driving it! Check back again here for that update.